Artisans from the Nguyen Dynasty were skilled in creating beauty from a broken piece of ceramic or porcelain. The whole world admires Japanese for the golden joinery art – Kintsugi – which turns broken pieces into arts, highlighting the cracks and repairs as simply an event in the life of an object. Little did anyone know that back then from early XI-XII century (during the Ly Dynasty from 1010 – 1225), Vietnamese craftsmen also collected broken porcelain pieces in the kiln to turn them into an architecture decoration. The service of beautiful porcelain would not come to end at the time of its damage or breakage. These craftsmen left an early heritage of embracing the flaws, the imperfection, and accepting change and fate as aspects of life. Indeed, this independent technique of Vietnamese ceramics and porcelain tradition is one of the most beautiful lost traditions of the world. Craftsmen in Ly Dynasty created an extraordinarily creative period that their works became famous all over the East Asian, even to the Middle East. After transferring the capital to Hue, the Nguyen Dynasty (1802-1945) had a renewed interest in ceramics and porcelain art with unique decorative motifs for the service of the court and royal life. Talented craftsmen who got skills in porcelain and ceramic joinery were chosen from different provinces over Vietnam and even given office promotion in the government department “Nề ngoã tượng cục”. There are many styles of porcelain joinery which can be seen in different royal architectures: imperial citadel, monuments, and palace, and pagodas… One must visit Khai Dinh mausoleum – the epitome of Vietnamese joinery art, and UNESCO World Heritage if he wants to understand this Vietnamese porcelain and ceramic art, the art of emphasizing the imperfections and turning them into an artworks to contemplate. Being known through era for his bon-vivant characteristic and wanderlust, no wonder why Khai Dinh had been travelling to many places, both foreign countries and local destinations. This explains his interest in various architectural styles of Vietnam, Gothic, Romanesque, India, Buddism, and so on, which could be seen clearly in his palaces, residences and especially his tomb. The 12th reigning emperor in Vietnamese history was also the very first ‘traveller’ who explored many new picturesque pristine nature of Vietnam such as Lang Co bay, which was recognized as one of 30 most beautiful bays in the world by the Club of the World’s Best Bays (Worldbays) in 2009. 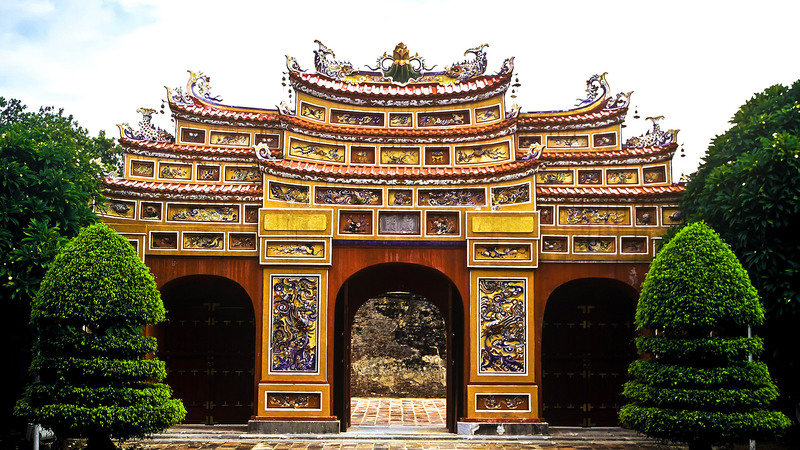 After ascending the throne on, Khai Dinh chose Lang Co bay to build up his summer palace Tinh Viem – Résidence d’Été de L’Empereur d’ Annam, and Chau Chu mountain to construct his “house after death” – the Ứng Mausoleum (Ứng Lăng). As the summer palace was totally destroyed due to the movement against feudalism, the mausoleum miraculously survived through war despite the fact that the king was very much loathed by his people due to his close collaboration with the French occupiers. The mausoleum took 11 years and cost the most in the history of Nguyen Dynasty to finish because of the complexion in designs and materials. Climbing 109 stone steps starting from the foot of the mountain was one interesting way to access to this place. The mountain where Khai Dinh placed his mausoleum was cerafully chosen based on its Feng Shui. There were hills in the left and right of the tomb, representing ‘Left Dragon’ and ‘Right White Tiger’ (Tả Thanh Long, Hữu Bạch Hổ) to protect the king. The Chau E ravine in front meant to lighten the way and the hill behind the tomb was said to be the king’s pilow. This mausoleum was home to an imperial audience court, featuring a columned gates influenced by Indian architecture, reinforced concrete stele monument in the shape of stupas from the Buddhist style, a Stele Pavilion supported by octagonal pillars with Romanesque-styled arch, as well as twelve stone statues representing bodyguards in Vietnamese traditional design. Close to the top floor was the Thien Dinh palace, the main building of the tomb that consisted of five parts attached to one another, and featured intricately designed glass and porcelain decorations on the walls, where craftsmen showcased their talent, were all intricately decorated with embossments joined by glasses, ceramics and porcelain, which reflected cultural and artistic values of the dynasty, the historical transition and the king himself. As one could easily see, decoration motifs in Khai Dinh tomb were taken from both traditional Oriental classic reference and Khai Dinh’s imperial life that had been Westernized. 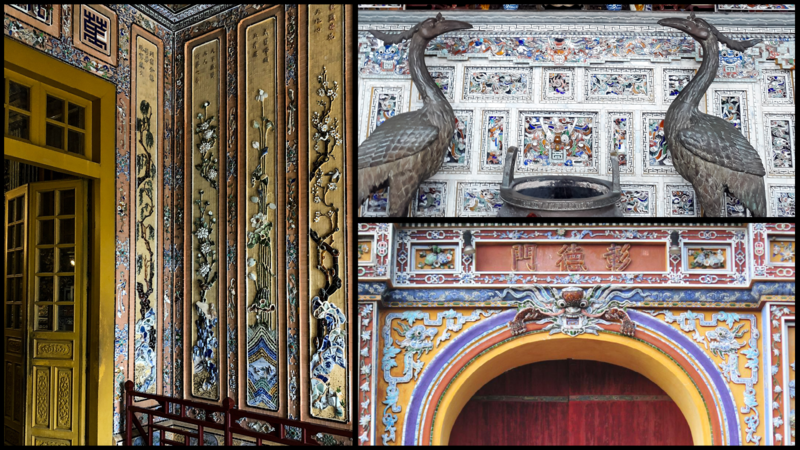 The ceiling of the palace was decorated with nine intricate dragons ‘Nine Dragons Hiding in Clounds’ painted by Phan Van Tanh artist. The rear room of the palace is home to a temple containing Khải Định’s grave, an altar to him as well as a statue of his likeness, cast in Marseilles. The front of the palace was decorated with with murals of the “Four Seasons” (spring, summer, autumn and winter which were represented by cedrus, bamboo, chrysanthemum, and orchid); the “Eight Precious Objects”including Jewels, Cash coin, Open Lozenge, Pair of Books, Mirror, Musical Jade Stone Gong, Pair of Rhinoceros Horns, Artemisia Leaf (Associated with the granting of wishes, wealth, victory, learning, unbroken conjugal happiness and counteracts evil influences, just and upright life, happiness, good luck and prevention of disease); the “Five Blessings”, and many others or spirits of prosperity like dragon, unicorn, turtle, paradise bird; and so on. As cut surfaces of glasses and porcelain reflected light during sunset, the whole room looked as if it was embroidered in silver. The stunning scenery simply took your breath away! Inlaying these intricate glass and porcelain mosaics for imperial buildings is more complicated and tough than anyone could imagine. The patterns and motifs are dainty and the glaze must be made by hand to ensure the performance and aesthetic appearance. Craftsmen must be very careful at the choosing and picking materials so that different colors and materials can be compatible. Then they honed and sharpened the pieces so that all would fit together according to the sketch as a sophisticated puzzle. As everything was all made by hand from organic materials, even the stitching glue for porcelain was made of leaves, oyster shells, honey and lime stones, it took more than just time and patience to practice the joinery art, which has become one of the most significant heritage of Hue Royal Architectures.